I have ink and consider it a big part of my wardrobe! Do any of you have tattoos you are happy to share? I hope I'm not the only ink fan on here. I never really considered having one. I'll never be able to think of something I'd be happy living with for the rest of my life. Thought about it... Concerned that I couldn't find a good artist at a reasonable price. Nice ink Rob, got you're third arm inked too, you the man!!! MarkB and Johnus are spot on. The right inking, artist and longevity would have me into it. Price wouldn't really be too much of a concern if it ticked all the boxes. You've really got to love that image for a long time. You are quite right in what you say, but looking at Robs Aka Blackmass ink he has thought that through and i expect he still loves it five years down the line.. Wish I could say the same about mine! They are not too bad just the typical stuff you get done as a young squaddie! 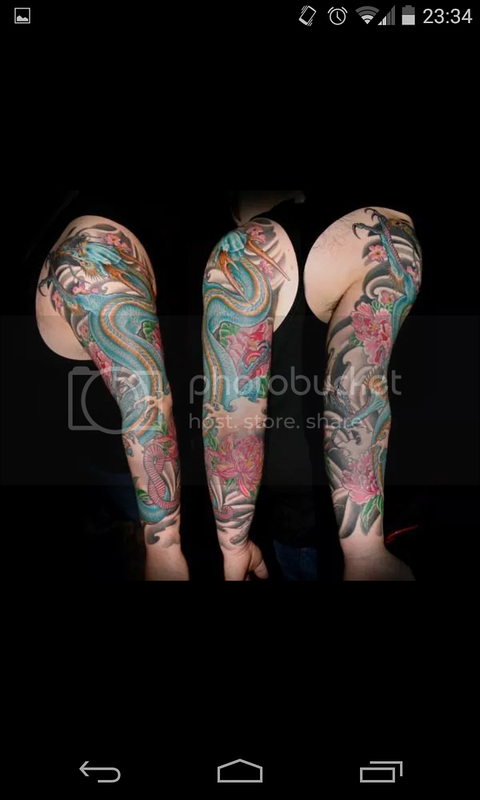 This is the tat that I want, maybe a bit cropped without trees. Would the colours and shades be replicable? I'm of celtic pale arse stock, if that helps. Sorry for the gratuitous boobage. BTW @Blademonkey I meant any image, not specifically Robs, because that is made of win! 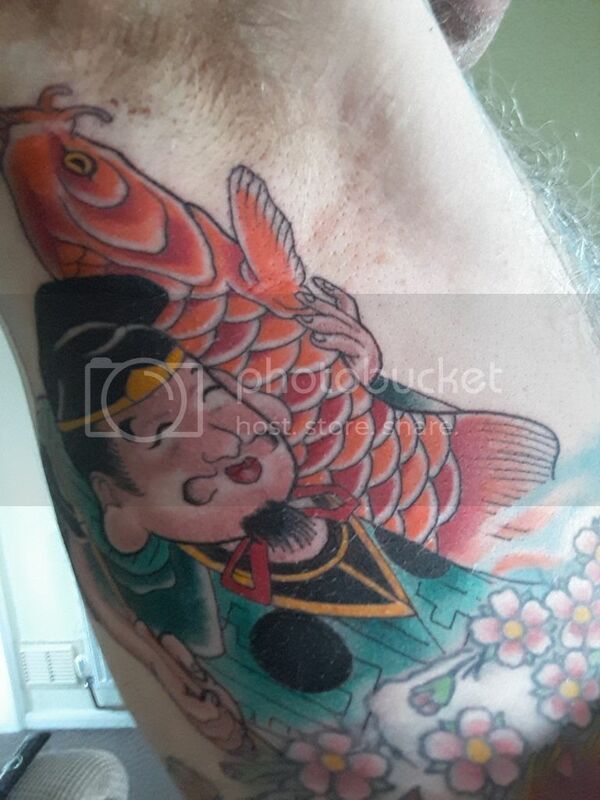 View attachment 21310 This is the tat that I want, maybe a bit cropped without trees. Would the colours and shades be replicable? I'm of celtic pale arse stock, if that helps. Sorry for the gratuitous boobage. These days any colour is doable! That would work with highlights and shadow. Nice one. Cheers geezers, it's the one image/emotion I keep returning to. You just need to find an artist of the ink to do the work for you. ^I took that photo 24 years ago, so I don't want to rush into it. It is a beautiful statue, it's not one I recognise so you will have to excuse me for my ignorance in not knowing who the lady is and where the statue is. It holds alot of meaning to you obviously for you to be holding on to a photograph you took 24 year's ago and for wanting it as a tattoo on your body. Currently on my 9th, it's about 80% complete. About another dozen hours to go. Blimey, couldn't she have made up some scenario about a pillow fight in their underwear or something? Seriously, sounds horrible. Can she not just get it removed? Covering it up with another tattoo sounds like disguising a wound scar by giving someone a burn scar. I've been getting tattooed since I was 14. YES 14!!! 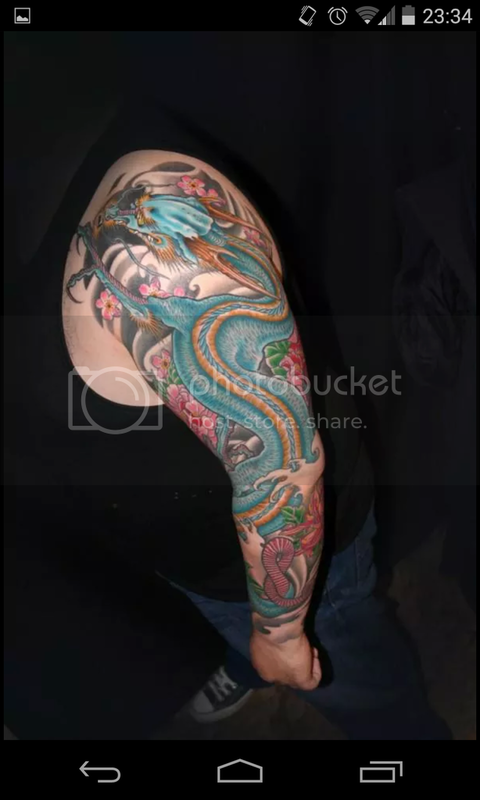 My arms were fully sleeved in Japanese style by the age of 18. They've been re worked and I'm now going for the full Japanese bodysuit. Chest, belly, ribs all covered, working on my back, and hopefully have my legs finished by the end of next year. This is the only photo I can find on my phone at the moment. . . Excellent work Paul. Who's the artist? I'm a big fan of tattoos and the culture that tends to surround them - I've been a lurker on 'bigtattooplanet' forums for a while but never had any solid ideas of what to get... plus I've not got the cajones to get one. My father has 3 and mum has one very small one, but they're both strongly against the idea of them. My father despises them because his are all 'on show' and has had to cover them up for the 40+ years he worked professionally, with long sleeved shirts on a daily basis, regardless of the weather. Trust me Benz ( whose better word to take than a stranger on an internet forum ! ) I've got three, and this pensioner is contemplating two more. One to be decided ( probably a shot from Electra Glide in Blue of Big John ) and a ' Do Not Resucitate ' over my heart in case anything happens and the attending physicians have any doubts as to my own preferences. If it hurt that much I'd not be sporting them. The biggest decision is more what and where than when.